What I Say.....This was one of those books that started slow but then ended up engrossing me in the characters. In the beginning, as Susanne suffers her miscarriage, and sneaks off to steal Carla's baby, I thought the book would be focused on that and stay in that time period. 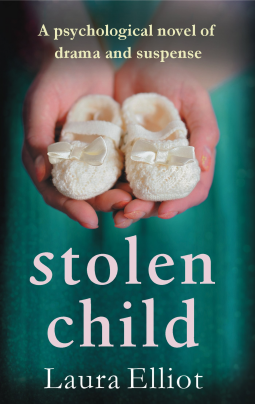 However, Susanna's kidnapping is successful, and so the book spans the life of Isobel/Joy as she grows into her teens. Susanne's guilt over what she has done, coupled with the grief over her last miscarriage lead her into an emotional shutdown, incapable of ever relaxing into the motherhood she desperately desired. Carla can't let go and move forward, losing her career, her privacy, her marriage. As their lives go forward, you see where they are interconnected, in their past and their present, which originally motivated Susanne, but now causes her to live in terror. Carla wonders if her past choices brought this tragedy on her. When I first started reading this book, I remember looking down thinking I must be halfway finished and looking down to see I was only at 24% completion. Yikes. But by the time I got to the second half, I found myself sitting in a parking lot pulling it up on my phone's Kindle app so I could finish it. Thumbs down on the budding romance between Carla and David. That was the only time that I thought the author took the easy way out. Not too realistic, but a tidy way to end an untidy story. ARC provided by Bookouture and Netgalley in return for an honest review.